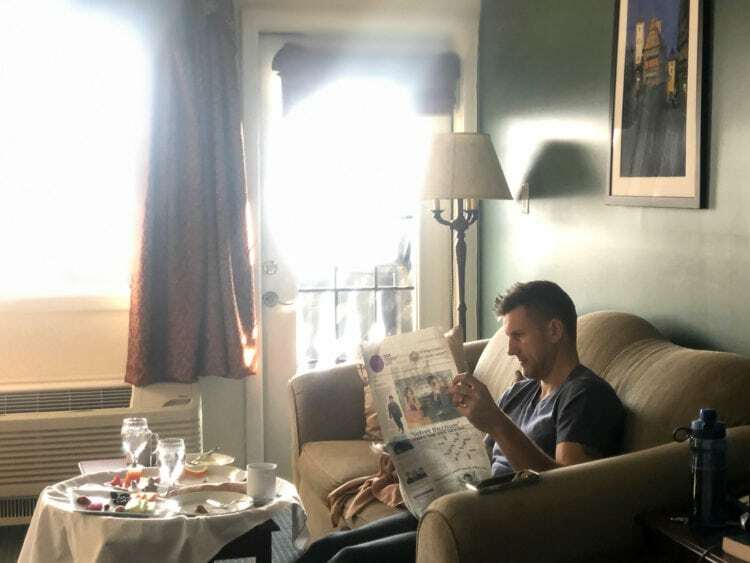 Two weekends ago, my husband and I went to The Bavarian Inn in Shepherdstown, West Virginia for a romantic getaway. I’m usually the travel planner; my husband doesn’t use social media and tries to stay off the internet as much as possible. However, he wanted to surprise me for my birthday, did research, and picked The Bavarian Inn. 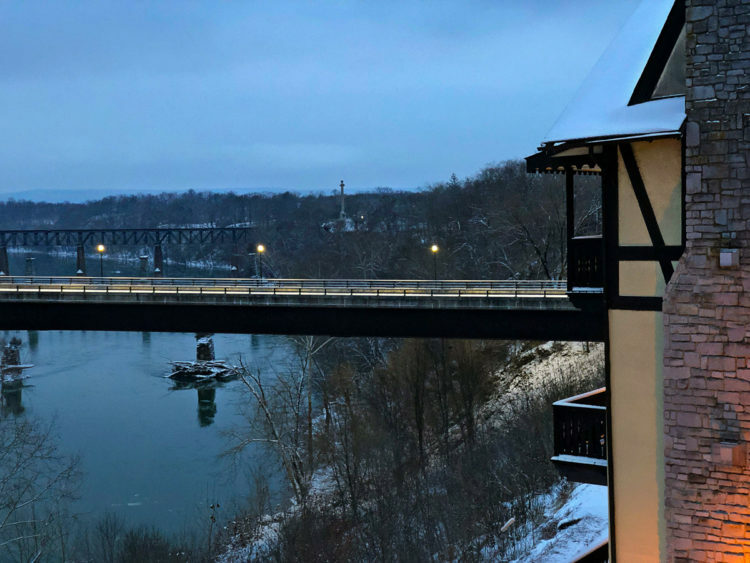 His journey onto the internet paid off, as our weekend getaway to The Bavarian Inn was utter perfection. My husband says it may have been one of his favorite getaways ever. 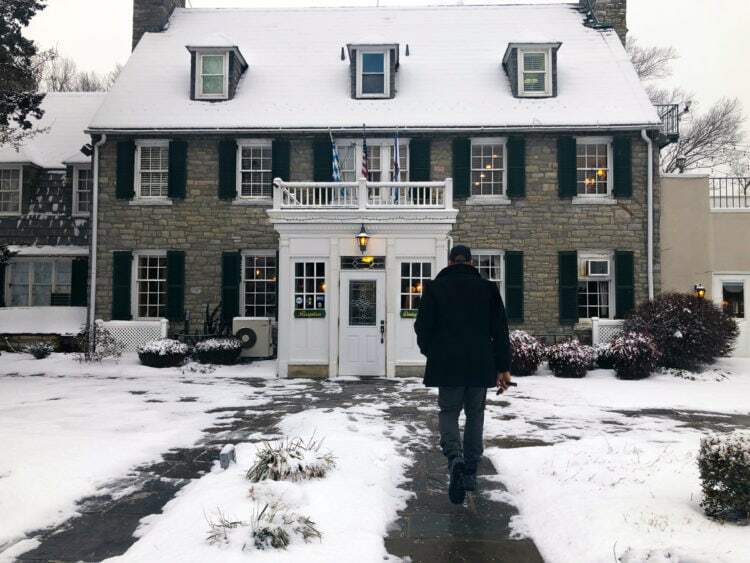 The Bavarian Inn is only an hour or so from the Washington DC area; even driving in snow, it took us less than two hours and only an eighth of a tank of gas. It’s less than four hours from Philadelphia and Pittsburgh and less than three from Richmond making it a great weekend getaway destination. Route 34 South goes past the Antietam battlefield then crosses over the Potomac River which divides Maryland and West Virginia; as you drive across the bridge The Bavarian Inn comes into view on the West Virginia side. 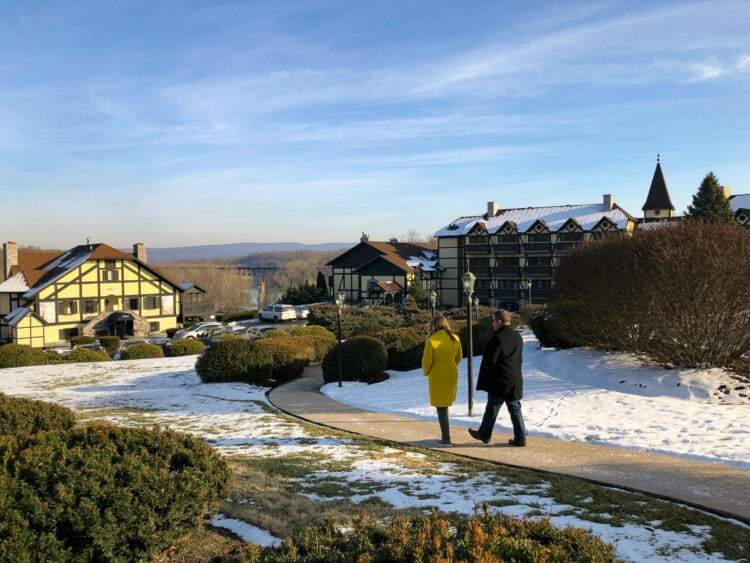 A 12-acre compound on a bluff overlooking the Potomac River, The Bavarian Inn is like a mini resort with its tennis court, infinity pool with bar, brewery, rathskeller, and fine dining. In March 1977, Erwin and Carol Asam left Washington DC and headed to Shepherdstown, West Virginia to open a new restaurant. Shepherdstown is the oldest town in West Virginia and has a deep-rooted German history. In fact, the main street is still called German Street to this day. The building was the Greystone Mansion, previously a private residence. Erwin, a native of Munich, Germany named it The Bavarian Inn. Erwin was the chef, Carol the hostess, they had five employees and the mansion’s living room was the restaurant’s dining room. Now, the Greystone Mansion has grown to hold a large formal dining room, a basement rathskeller, a brand-new modern brewery with a bar and two dining areas, and much more. The original living room is now the reception area and the Asams’ sons Christian and David now run The Bavarian Inn. The Bavarian Inn offers 72 rooms across their four riverfront chalets and their recently added Schwarzwald Haus (Black Forest Hall). 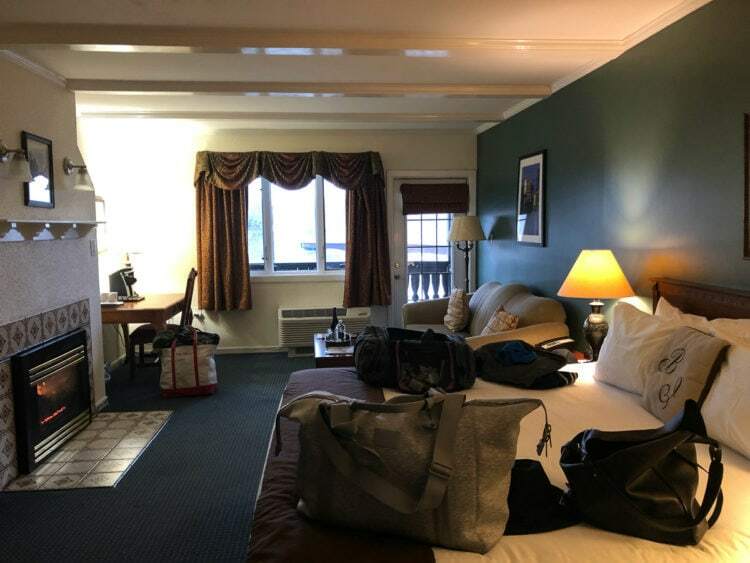 There are seven different types of rooms to choose from in regard to size, view, and accessibility (most of the rooms at The Bavarian Inn have several steps to access them). 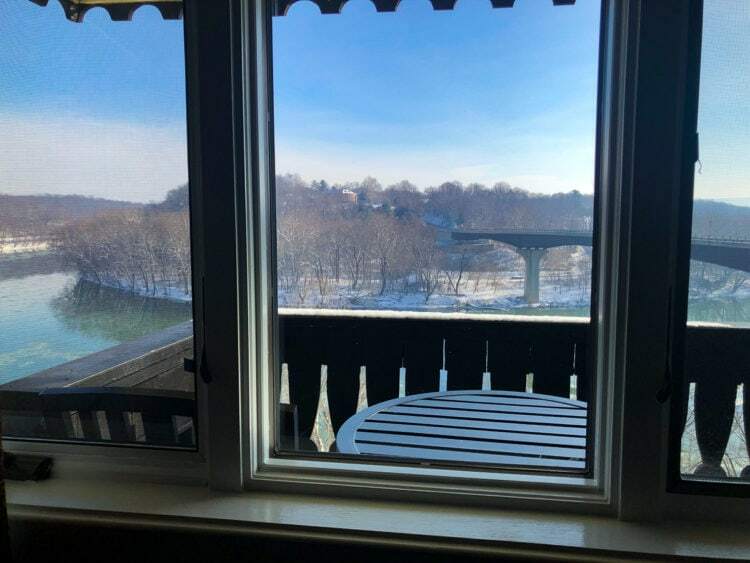 We chose a Potomac View Premier room which offers a private balcony overlooking the Potomac River, king-sized bed, sitting area, gas fireplace, and a whirlpool bath. We were placed in Room 1, which is up a couple stairs in the Augsburg chalet. The door to our room was outside, but under a porch. It had been snowing all day and the temps were in single digits. The stairs were very well salted and the room was cozy and draft-free. The room was quite spacious. I loved how there was a second sink and mirror outside the bathroom. The bathroom was huge; the tub so big my husband and I could both be in it next to each other and so long his 6'4″ self could submerge. It had a rainfall-type shower above. The room had a refrigerator and a Keurig machine, an iron and board and high-powered hair dryer, and plenty of extra blankets and pillows in the closet. The couch in our room could pull out into a bed. There was also an armchair; we comfortably entertained friends in our sitting area and had enough seats for all. The balcony was private, narrow but big enough to have a high-top table and two cushioned chairs. 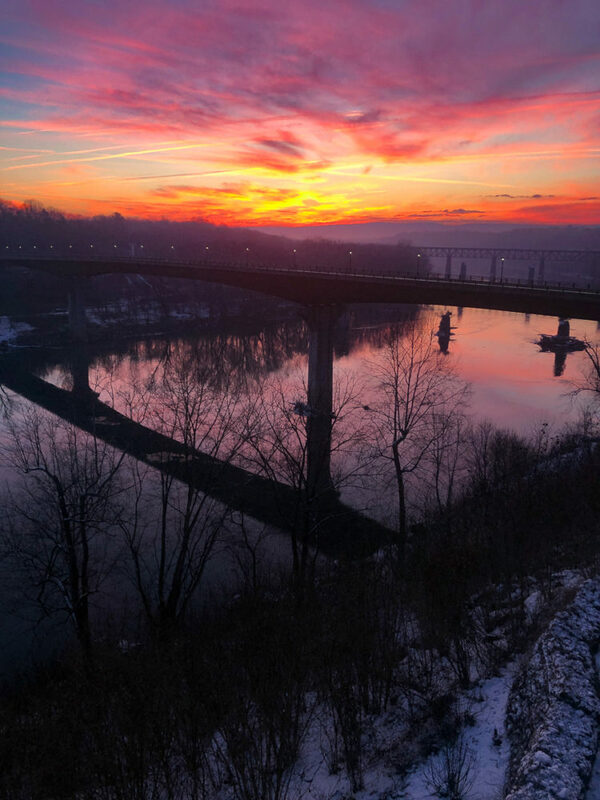 The view was phenomenal, and the building angled to get the best view of the sunrise over the river and Maryland side of the bridge. Because we visited The Bavarian Inn with friends, we were able to see more than one room and learned that none of them look exactly alike. Different layouts, different furniture and décor, and different ages/dates of when they were renovated. Our bathroom looked to be more newly renovated than our friends’ though both were spacious, extremely clean, in good condition and had giant whirlpool tubs. Our friends had a four-poster bed while we had a simpler headboard. We both had the same gas fireplace, but our rooms had different tile surrounding it. Our room was up a couple stairs with an outside door, their room was down several stairs and you went through a door to a closed hallway to get to their room (they did choose a lower level premier). 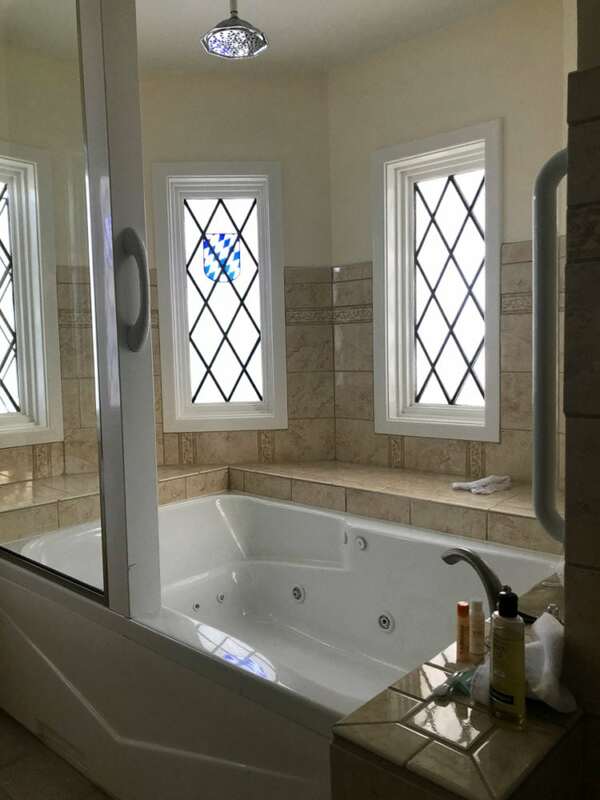 Our bathroom was in the “turret” of the chalet, so our bathroom had windows (milk glass, but provided natural light) while theirs was an interior wall without windows. I share this because online reviews can be confusing. Some will say the rooms are dated, others will say they are not. It’s important to remember The Bavarian Inn is not a chain and throughout the stay, we saw little unique details that showed how this place has been here for over 40 years, is family owned and is regularly tweaked and updated bit by bit. Our room wasn’t super modern, but it was incredibly clean and way homier and more comfortable than fancy hotels in DC. This is a good time to mention the price. We didn’t contact the Bavarian Inn; this post was not sponsored, nor did they know we were coming to visit. We booked our room online, no promo codes and for two nights in our fabulous room, the cost was less than $600 (and our friends’ room was less than $500). My husband when researching places for our romantic weekend getaway found most places almost twice this price. I’ll be honest, I can’t well answer this because our weekend was about R&R and that’s what we did. Saturday, half of our party went for a hike at the Antietam battlefield, the other half of us went to the gym. The Bavarian Inn has a gym, but it was under maintenance. No worries, the Inn has a partnership with the Shepherd University Wellness Center down the street. Visit the front desk and staff will provide you with passes to use their gym for free. The university’s gym has plenty of free parking and is incredibly well appointed with a mile track, a kazillion machines, free weights, mats, bands, and most anything you could desire. Please note the Shepherd University gym requires everyone to wear shirts with sleeves; no tanks or sleeveless shirts. We didn’t know this, but the gym’s front desk has a box of clean (some still with tags on them) t-shirts for you to borrow for your workout. Outside the Greystone Mansion where the bars and restaurants are they have a firepit with several Adirondack chairs. 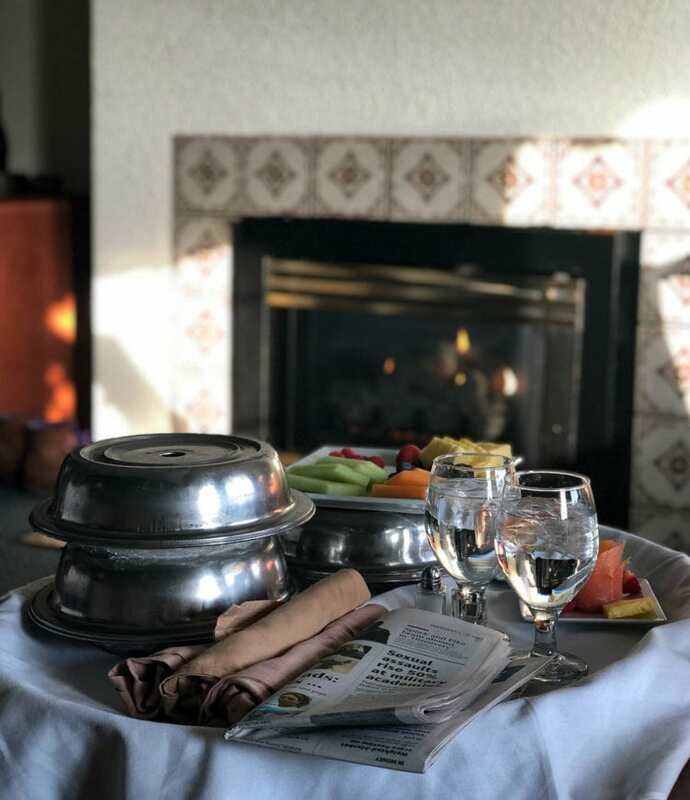 The Bavarian Inn offers blankets and will serve warm drinks so it is a place to enjoy year-round. 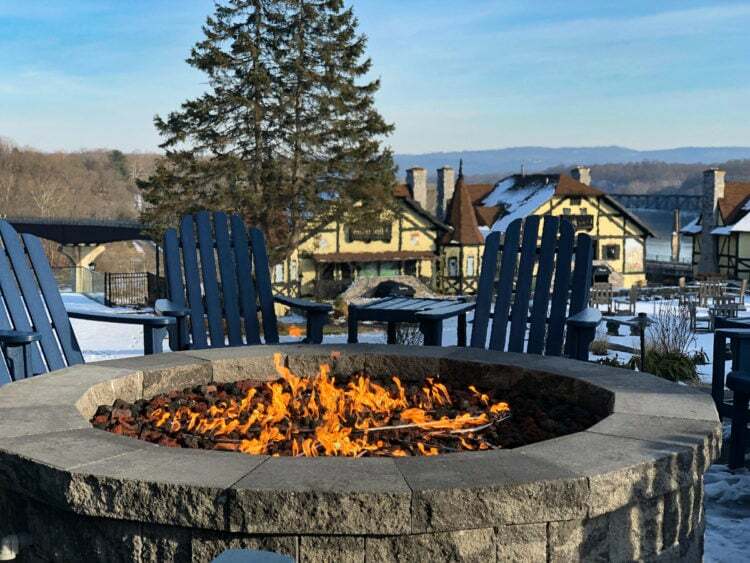 When the weather is warmer, the Bavarian Inn has what looks to be a beautiful infinity pool overlooking the Potomac River bend that also has a sundeck and bar with snacks. There are also tennis courts and the front desk is happy to suggest places to go and things to do in the area. But honestly, this is a great place to go for doing a whole lot of nothing. The room was so comfy with the fireplace we napped, we read, we sat out on the balcony and watched the river… it was really nice to have nothing planned, nowhere to go, no issues with parking or timing or coordinating. 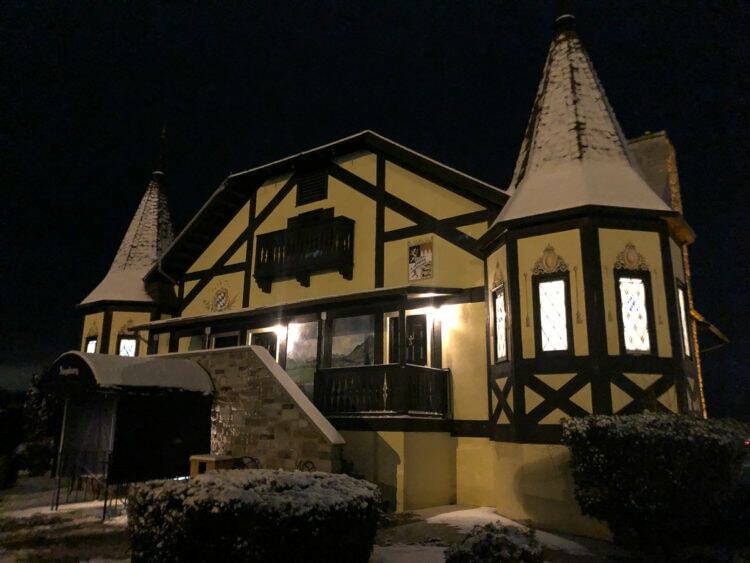 As previously mentioned, The Bavarian Inn has three dining establishments on site in the Greystone Mansion and during the warmer months a fourth at the pool. The Bavarian Inn also offers room service from 7am until 9pm (orders include a nominal room service charge and 18% gratuity). These are all under Chef Jeffery Ault, who I saw multiple times over the weekend visiting tables, observing the rooms, and chatting with the waitstaff and bartenders. Friday night we dined at the Bavarian Brothers brew pub and lounge. 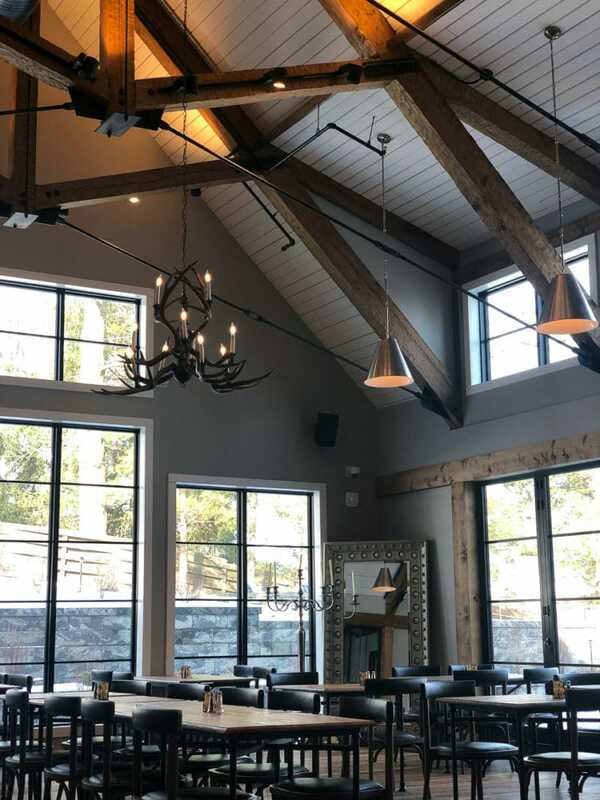 Directly off the reception area, there is a nice-sized bar, several leather couches, a fireplace, and plenty of table seating near the fireplace and in an atrium with an A-frame style ceiling with exposed wood beams and an antler chandelier. We had a table between the bar and the atrium which had a good view of both inside and the outdoor fire pit. We were provided both the bar menu (small plates, salads, and some German dishes) and the Potomac Room’s menu (several pages of elegant options) and were able to order a bit from both. This meal was phenomenal. The bartender was our server and he knew the menu well and made some great suggestions. Service was excellent. We enjoyed raw oysters, appetizers, entrees, and desserts and there wasn’t a single complaint at the table. I had the rack of lamb which was perfection. My husband had the venison and he said it was so good he considered ordering it again the next night. 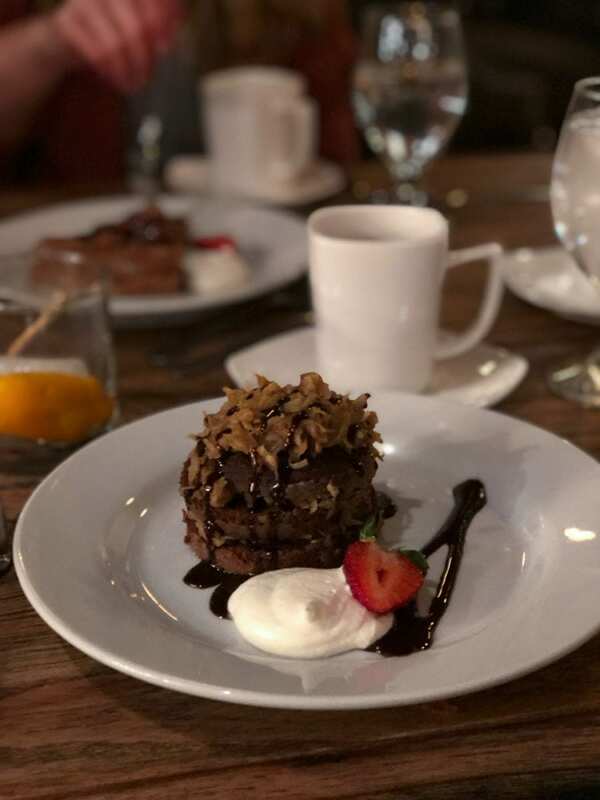 For dessert, I had the German chocolate cake which was a small round individual cake that was both moist and light. I planned to eat half and take the rest back to the room for a late night snack but it was so good my husband and I finished it at the restaurant. We dined again at Bavarian Brothers the next day for a slightly late lunch. Since The Potomac Room wasn’t open at 2pm, we only had their menu to choose from. We still had an amazing selection to choose from. We ordered several small plates for the table and each of us chose something for ourselves. We loved the ahi tuna tacos and pulled pork “egg rolls” so much from the night prior we ordered them again along with the Pickled and Pickles. Again, delicious. I had the beet salad as my entrée and it was yummy and perfectly balanced. The Potomac Room is the restaurant The Bavarian Inn is best known for. A fine dining establishment, we saw many people on dates and celebrating special occasions at the tables. Proper dress is required; they recommend men to wear jackets though they let us in with dark jeans, non-sneaker shoes, and nice sweaters. We dined at The Potomac Room Saturday night and for Sunday brunch. Saturday evening’s dinner was lovely. The menu is extensive, a mix of traditional German fare and American dishes that change with the seasons. The waitresses were dressed in dirndls and were quite attentive without being overbearing. The room is a bit dated but charming in that we felt like we were at the resort in Dirty Dancing. I started with the curried cream crab soup. I was served a bowl with a large helping of chilled crab meat; the waitress them poured the hot soup over it. It wasn’t heavy like traditional Maryland cream of crab soup and it was nicely seasoned with a slight kick though I wish it was warmer. For dinner, I had the filet mignon which was like butter. Quite delicious, but couldn’t hold a candle to the rack of lamb that I am still dreaming about. For dessert, I had some sort of ball of ice cream covered with peanuts, chocolate sauce, and coconut. It tasted like a rich, grown-up version of a Nutty Buddy. We heard the Sunday brunch at The Bavarian Inn was a do-not-miss. Brunch doesn’t begin until 11am so we packed up beforehand and enjoyed coffees and Bloody Marys at the Bavarian Brothers bar until it was ready. The buffet is set up in the atrium and it is extensive. I did two rounds at the buffet and still didn’t see everything. A raw bar, a table just of German dishes, desserts, small bites, a carving station, an omelet station, a table just of pastries, even mild options for kids (crackers and cheese and PB&J). The waitstaff was great at keeping our water glasses and coffee mugs filled. We were told reservations were practically a necessity for dining in The Potomac Room. We definitely needed them for Sunday brunch as the place filled up quickly and remained full. However, Saturday night the room was maybe half full. That being said, it was a cold and wet night in February and we dined at 8pm. I can imagine it would be busier when it gets warmer out. We didn’t dine or drink at the Rathskeller, but we did go downstairs to check it out. It’s like a blast from the past with wood paneling and live music on Friday and Saturday nights. There is a bar but also seating for lounging as well as dining. 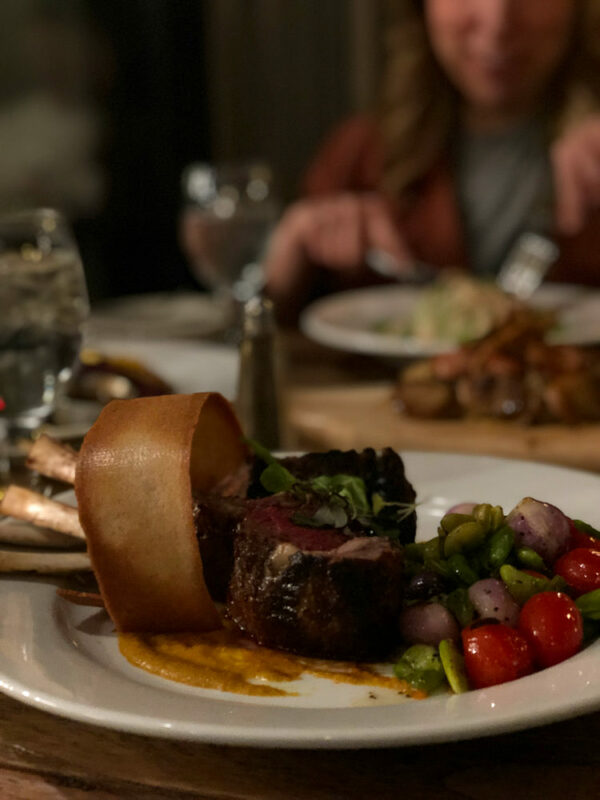 The Potomac Room’s full menu is available. The Rathskeller is full of vintage charm and I’d definitely check it out if we return. Room service is offered from 7am to 9pm. We tried it out for Saturday morning breakfast. Since we had a coffee maker in our room and brought our own coffee, we only ordered food. It only took 15 minutes for the food to arrive. The menu offers a smaller selection of items from the Potomac Room menu but enough variety to make most people happy. We were able to switch out the breakfast meat of one dish with smoked salmon; they not only replaced the salmon on the plate but they offered a second small plate with more salmon rolled into a rose and garnished with fresh fruit. The Bavarian Inn has everything covered. As their tagline states, the only thing they overlook is the Potomac. The room has a bottle of wine and a bottle of water (they aren’t free but they’re at the ready). The Keurig coffee maker comes with a variety of coffees and some really cool organic teas. There’s a wine bottle opener, wine glasses, coffee mugs, and even two apples. Bathrobes, tons of thick white towels, additional blankets and pillows in the closet. Service was phenomenal. The front desk staff was perky and friendly, the young man who brought our room service was cordial and so polite, all the bartenders and waitstaff were great. We regularly saw the chef and general manager walking around, checking in with staff and guests alike. It was snowing when we were there, yet all walks remained snow-free, ice-free, and well salted. The rooms were incredibly clean upon arrival as well as after housekeeping visited. 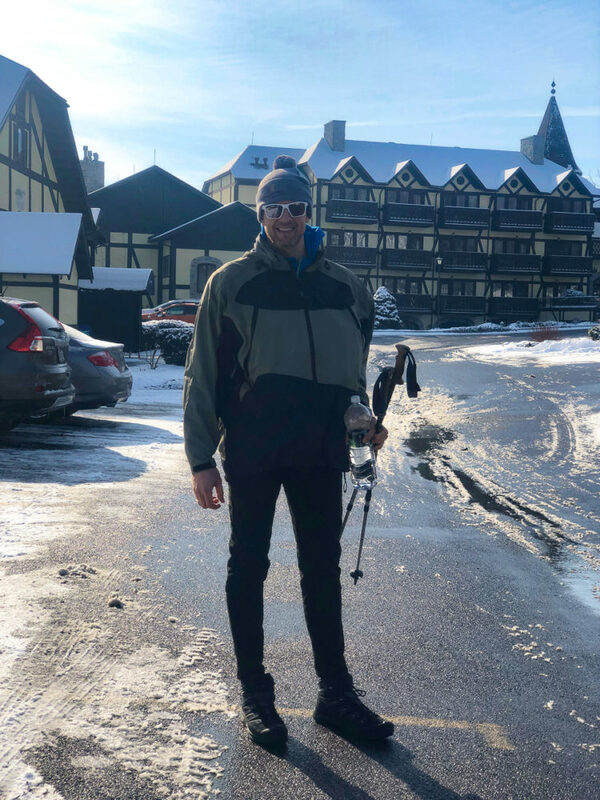 If you have mobility or strength issues, The Bavarian Inn may prove difficult. Unless you stay in one of the main floor rooms in the Schwarzwald Haus you will be taking at least five stairs to get to your room (and to get your luggage to your room). To get to the Greystone Mansion from our chalet, we had to go up a hill which had multiple paths, some smooth and some with stairs. There are many reviews online complaining about this. I think considering the place was built over 40 years ago they’ve done a good job making it as accessible as possible. They also are quite transparent about this on their website. I'll admit I worried considering the place and location that everyone else staying there would be white and over 60. I have experienced such when sometimes visiting smaller towns outside the DC area, but it wasn't true for The Bavarian Inn. There was a variety of ages and races staying at the inn, at the restaurants, and on staff. This place is charming, and the longer we were there the more we liked it. First glance it may seem dated, but the longer you are there the more you realize how much thought is put into each detail to ensure you are comfortable. 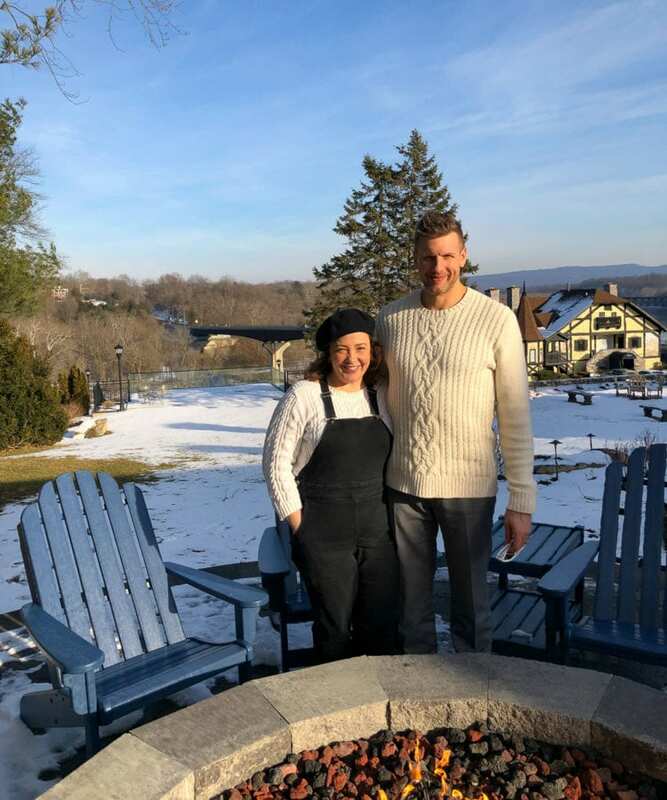 We both hope to return to The Bavarian Inn during a different season to see the foliage, enjoy more of the outdoors, and take a dip in their infinity pool! This stay was NOT sponsored. The Bavarian Inn had no idea we were coming nor that I was writing this review. However, I did tag them in some of my Instagram Stories from the evening (view the Stories in my Highlights below my Instagram bio) and they saw them. In thanks for the promotion, they did comp us our appetizers from Saturday’s lunch. This is a completely honest review, and all thoughts are my own. If you have any questions, ask in the comments below and I will be sure to answer honestly. My partner grew up in a largely German-American part of Michigan. I think he’d love staying at this place, as would I. I can’t make up my mind if the cozy. comfy large room or the food is more appealing. I think I’ll take both. It also looks like a great place to do outside walks in the clear, fresh, winter air. Karl definitely picked a winner in the Bavarian Inn (and in you). He knows you so well. I love how detailed and informative this was–what a beautiful place. Their tagline is awesome, too…”The only thing we overlook is the Potomac”–I love it! It sounds like you had a really nice opportunity to relax and reset after a very hectic couple of months. That sunset alone is worth a trip. Thank you for sharing with us! I always enjoy your travel reviews, Alison, because they are PACKED with detail – I don’t think you leave a single question unanswered! I think you and Karl look great in your matching cable-knit sweaters. LOL thanks! We often end up dressing alike without trying! It looks phenomenal there. If only I lived closer… I was born and raised in the Northeast but now live down South. It’s funny, but when I lived up North a “winter” vacation always involved sun, sand and a tropical climate. I enjoyed reading about the good time you had, even with all that snow on the ground, lol. What a great weekend get-away! It really sounds lovely and relaxing and that’s what everyone needs sometimes. Thanks for sharing it with us! I’m so envious of the area you live in–you’ve got so many great travel options within very short drives. Very nice!